MSV: Bhalla Bros: "We know an override will happen" but let's get political! Bhalla Bros: "We know an override will happen" but let's get political! In a MSV exclusive, a text message between Mayor Ravi Bhalla, his brother and others obtained in a leak discusses tonight's vote on the veto by the new mayor to politicize an expected override on a proposed referendum to allow Hoboken voters to consider runoff elections this November. 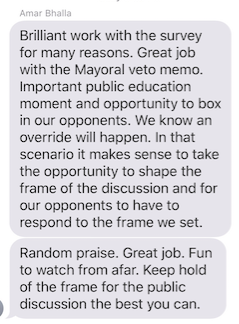 The January 31st text originating from the mayor's brother, Amar Bhalla admits that winning with a veto is a lost cause writing, "We know an override will happen." The third City Council action on the runoff referendum is expected to pass again easily by resolution tonight. But Amar Bhalla celebrates what he feels will be a political victory after the same referendum was overwhelmingly passed twice earlier by the Hoboken City Council in a 7-2 vote. "In that scenario it makes sense to take the opportunity to shape the frame of the discussion and for our opponents to have to respond to the frame we set." In essence, the text as seen below in its original form is an admission almost the entirety of the Hoboken City Council, seven of its nine members are viewed as "opponents." Amar Bhalla ends the text message to his brother the mayor adding "Random praise" and calling it "Fun to watch from afar" before concluding his advice to "Keep hold of the frame for the public discussion the best you can." Last week, Mayor Ravi Bhalla attended and spoke at the Hoboken Democratic Committee meeting where he made an appeal for support of his veto. His office is reportedly seeking people from the Hoboken public to speak in favor of his veto tonight at the council meeting in a "dog and pony" political but useless action. The exchange is the second significant leak obtained by MSV in recent months from the Bhalla camp. The first was publishing the contents of a Bhalla campaign poll last October. The details of the poll showed Councilwoman Jen Giattino leading the mayor's race with Ravi Bhalla a close second (A statistical tie when the poll variables are factored in). MSV can confirm its original story as a second source has come forward confirming what was described as the Jen Giattino "surge." Within days, the Bhalla campaign viewed Giattino as a top adversary and issued campaign mailers to all Democrats in the Mile Square City to vilify her as a Trump supporter putting her photo beside a Trump hat. Giattino had stated earlier she voted third party in the 2016 presidential election but the Bhalla campaign responding to its bad poll, ignored what Giattino said and smeared her. The politicization of Hoboken's non-partisan municipal elections were trumped by cynical politics and a Ravi Bhalla "terror flyer" many conclude was designed to win him sympathy days later in the election where he was victorious with less than 33% of the vote. Amar Bhalla does not work at Hoboken City Hall and is employed by the radical leftist George Soros group, Open Society Foundation. The office of the mayor was contacted but has not responded with comment to this story. Update: As thought, the City Council voted 7-2 once again in favor of a referendum allowing Hoboken voters to decide whether they want to bring back runoff elections. It also voted for a resolution advocating for instant runoffs. Councilman Mike DeFusco got word of the MSV exclusive shortly before the meeting and when the discussion on the referendum came up; he read into the record the Amar Bhalla text message on MSV and challenged the politics of the Bhalla administration. Councilman Jim Doyle was taken aback and stunned by the breaking information and was unsure how to respond about the "allegation." Then all hell broke loose. Almost every council member got into the act. More to come.